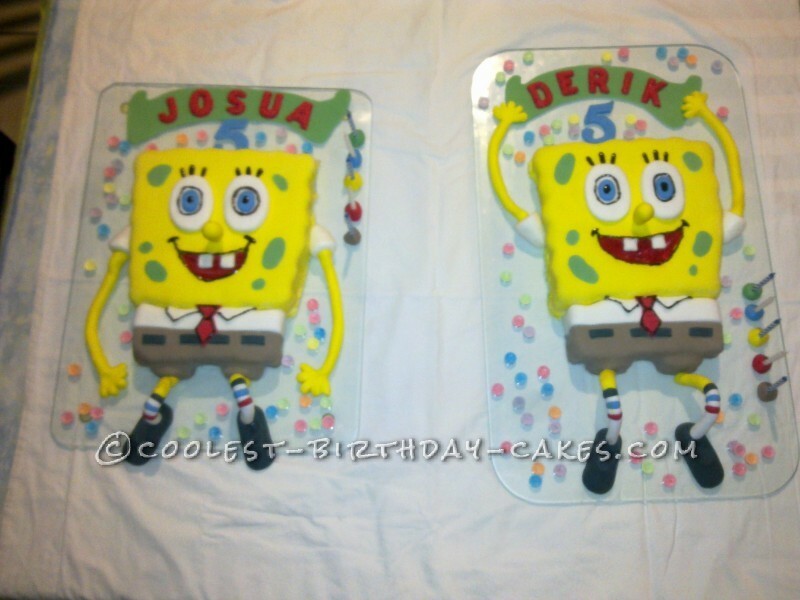 My son and his best friend did their 5th party together, with a Sponge Bob theme. Which means I had to make two cakes for the two boys. I studied Sponge Bob and discovered that every dot on Sponge Bob’s face has a specific place and size. I enlarged a picture of Sponge Bob and then I cut it out. 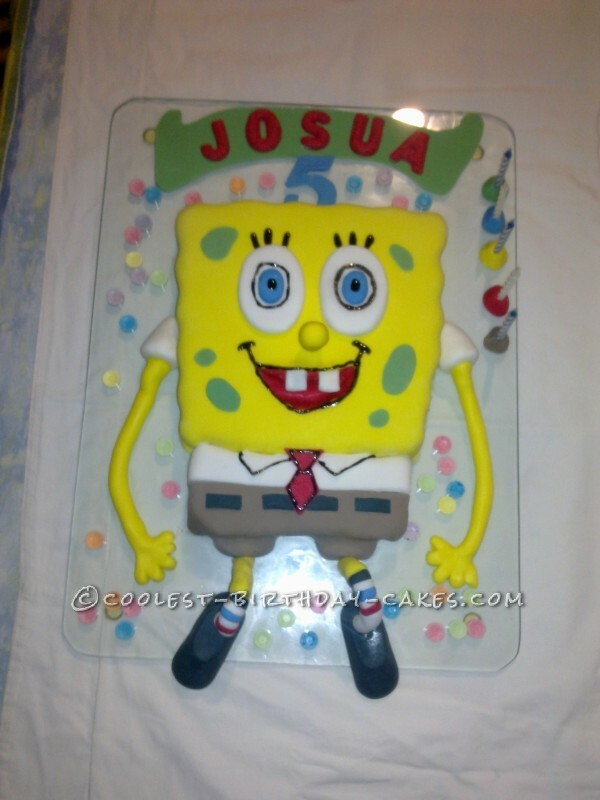 I then placed it on a sponge cake to get the shape of the figure correct and cut out the cake. I used the cut out paper picture to determine the exact position of the mouth, eyes and dots. I then cut out a hole for the mouth. 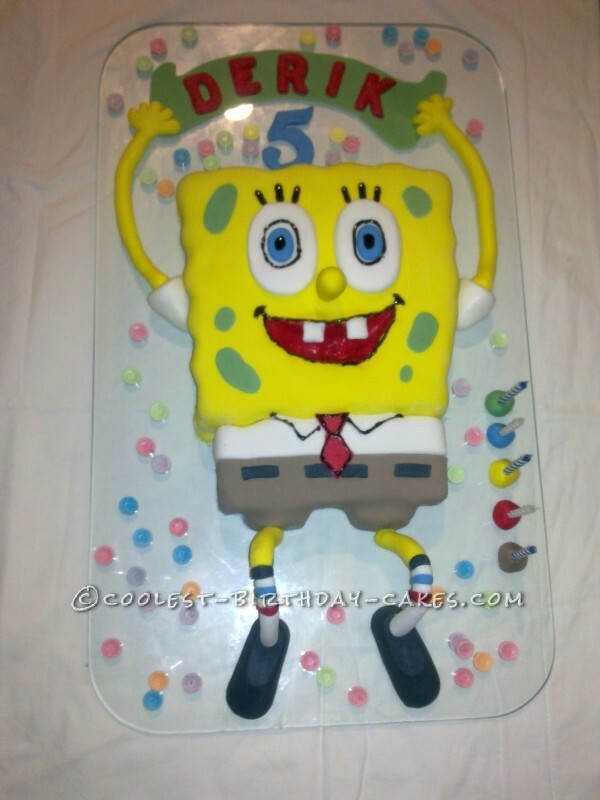 I first covered the cake with butter icing and then I wrapped the cake with plastic icing to ‘color in’ Sponge Bob’s Face. Remember to first fill the mouth with red icing, as this would be difficult to do at the end. I also used plastic icing for the arms. I bought a mold for the shoes and an alphabet mold for the names. All done in plastic icing. The legs were done with florist wire covered with ‘beads’ of plastic icing. As I am not a professional, I managed to let the two faces look a little bit different. I also positioned the arms and legs a little bit different for the two boys. Children and adults loved the two cakes, and even commented on the fact that the two cakes, although the same, had individual features.